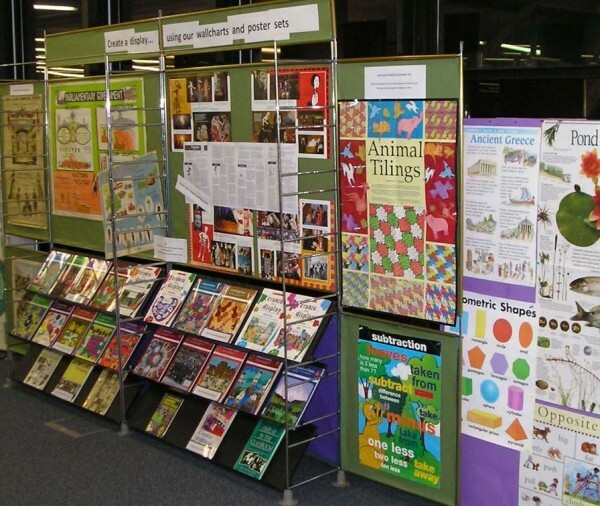 Our January exhibition in the library features books about classroom display, and includes a number of posters and wallcharts from our Curriculum Resources collection. To illustrate the change in styles over time, Elizabeth, who assembled the display, has also included a number of charts from past times. Although publishers of this sort of material have come and gone over the last fifty years, two of the charts are from an organisation that perhaps did more to brighten classroom walls than any other – Pictorial Charts Educational Trust (PCET). The inclusion of these items from PCET was made all the more poignant when we discovered that the co-founder of Pictorial Charts, Dorothy Tyler, had recently died at the age of ninety-nine. Started with her husband David Tyler, PCET, a not-for-profit educational publisher, had operated from Hanwell in west London since 1938. In later years the organisation developed photo-packs and books in addition to their wallchart output. The publishing activities and stock of PCET were acquired by educational resource publisher Wildgoose, in 2009. The David Tyler Trust was formed following the change in management of Pictorial Charts Educational Trust to continue the ethos of PCET, “To promote education and to provide facilities for experiment and training in educational principles and methods”. This entry was posted in Library and Archives and tagged Curriculum Resources, displays, wallcharts. Bookmark the permalink.